CNN just posted an article titled “Before judging ‘late-term abortion,’ understand what it means, doctors say.” I agree with the sentiment. There is way too much heat and not enough light in this complex and highly emotional debate. 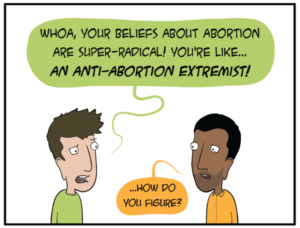 Ah, I see, kind of like how the term “anti-abortion extremists” is an invention of pro-choice supporters “to confuse, mislead and increase stigma”!